We went out to my mom and stepdad's on December 23, the plan being to spend a few nights there to celebrate Christmas together. Step 1: a visit to Santa on Christmas Eve morning. I asked Maddie what she wanted to wear to see Santa, and she replied "Oh, something special!" detailing an elaborate outfit with multiple layers. Riley requested "regular clothes." I dutifully went back to our house to retrieve Maddie's clothing, and presented the outfit to her the next morning. "Oh, Mama, I think I'll just wear my pajamas." Then Riley spotted Maddie's rejected finery. His eyes lit up. "Oh, Mama! Can I wear that?" "Of course, my love, of course." 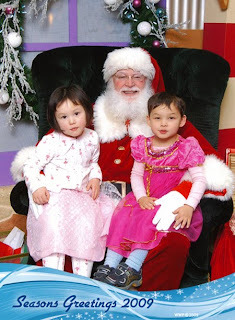 So off we went to the mall, where the twins met "the real Santa." Their expressions in the photo do not capture how much they both truly seemed to enjoy the event. It was a good start to a good Christmas. Oh my goodness, that is hilarious. Thanks for the laugh. This makes my heart smile - thanks. Best Santa picture, ever. Thank you for sharing. And thank you for letting Riley be himself -- bright pink dress, loafers and all. Priceless. I'm glad you posted. I've been thinking about you and the kids the last couple of days. Happy New Year. That's such a great picture. Adorable. And I have to echo Jennifer in her sentiment. Man, those are some gorgeous kids you've got there. Adorable! Riley looks a lot like John, I think, and I see more of you in Maddie. Gorgeous kids! Happy New Year to you three. It's been a hard year all around, I think, and I'm hopeful for the next decade. That is AWESOME! I nearly shot milk out my nose. Best Santa picture I've ever seen! Best. santa. pic. ever! I'm still laughing. I bet this will be blackmail for Riley in about 12 years. That is brilliant! Wow. I love that you just went with both of their outfit choices. You have serious ammo in years to come. Even better than naked bath pictures. You are a rockin' cool mom, Snick! Precious, funny photo. Your kids are perfect and you are an excellent Mom. Get ready for this picture to go viral! I'm glad to see that our little guy isn't the only one who loves to dress up, literally! Mateo would happily wear his sister's pink dresses (which we rarely put her in) every single day. Great photo! This is brilliant, Snick. Hope you had wonderful holidays! WOW!!! That is SOOOO awesome!!! hahah I laughed too much-- what a memorable moment;-) YOu going to tell those kids this story for a long time. This is easily the best Santa picture I have ever seen. Hope you had a very merry holiday. HAHAHAHAHAH!!! That is one of the cutest things I have ever seen! I love it!!! This picture made my whole day. Love it! That is definitely the best Santa picture ever! Riley is such a sweet, sweet boy. Glad you all had a good Christmas! That will be a great blackmail photo when he is a teenager. lol! So adorable!!! I love it! And it's great that you just let them wear whatever they wanted to see Santa. That's part of the magic, isn't it? Letting them just enjoy what they like for Christmas. Oh, the innocence of children. May Riley always feel as comfortable and happy as he does in that pink dress. What a lovely picture, though I suspect that Riley of the teenage years will blush when you tell that story. Just beautiful...I love how you let them just be themselves and offer them choices whenever appropriate. You are an amazing Mama and are raising beautiful little people. Wow, am I the only one that thinks this is just wrong??? I just dont know really what to say. I have been following your blog for some time and also enjoyed the adventures in your life with your darling twins. But I think I am done. AHAHAHA! Love it! Anyone who doesn't just die of the cute looking at that is dead inside. I hope that I'm that cool when my little peas ask to sport their concoctions in public. That is the perfect card - it shows real life. Good on you and HNY and beyond! I am with the previous anonymous poster. So so wrong. I think it is horrible that you let him wear girl's clothes. ahahaahah!!! That is a RIOT! He is sooo going to hate you for letting him do that when he is older!!! Priceless!!! Interestingly, until the early 20th century, little boys wore dresses every day of their lives until they were considered old enough to be "breeched," at about age 7 or 8. If you look at old photos, it's hard to tell the boys from their sisters, especially because a lot of them had long hair lovingly curled and beribboned by their mothers. It doesn't seem to have destroyed civilization, since we're all here today. Just sayin'. Anyway, I think it's a classic pose, and Maddie and Riley will definitely look back on it and laugh (or groan, or both) when they're older. Happy New Year! This makes me happy in so many ways. Happy New Year! I hope this year is a great one for you and M and R.
Love that picture! So timely too...just yesterday I found my two little ones (boy and girl) upstairs having a tea party, and both were in PRINCESS DRESSES!!! Life is too short not to have some fun!! Wishing you all the best in 2010! Oh Snick, you are the coolest Mom ever! Letting Maddie and Riley just be themselves. Good on you. Happy New Year to the Snickollet family, you deserve it! How adorable! There is absolutely NOTHING wrong w/letting little boys dress in their sister's clothing. It only shows that they adore their twin...& then to say they have a fantastic Mommy who lets them CHOOSE when opportunities are there. I'm not so sure R will object to seeing this photo in years to come. And, I agree with the comment from the 2nd Anonymous to the 1st Anonymous' comment ---- goodbye!!! I applaud you for being such a great Mom to your precious children. I hope 2010 brings the three of you many happy moments making these kinds of memories. They are gorgeous! Such great faces. This is so wrong! But then I am a sixties kid brainwashed by "Janet and John" books as soon as I started school. I always read your journal,you have been on one hell of a journey raising your kids and what a great job you do.I wonder though what your parents think of the photo? My parents were with me when the photo was taken! They have no problem with it, or if they do, they haven't said a word to me :). Thanks for the kind words, and for reading the blog. Thank you for replying Snick .And a Happy New Year to all of you from Leeds,West Yorkshire, U.K. I too have boy/girl twins (now 7 1/2 years old). When they were probably 2 through 4 yrs old, my son used to love to wear his sister's bathing suits! We have several pics of him wearing a pretty pink polka dot suit and several of him wearing a skirted Dora suit. To this day, they are my favorite photos of him! Enjoy the New Year! I echo what everyone (except the backward-thinking anons) have to say about this photo. One other thing I absolutely love is how much Santa seems to be enjoying himself, too! I commented on FB about this photo-I think it is CLASSIC. As the parent of children who are now grown and happy, stable, settled adults, I can say, "GO FOR IT!" Let them wear what they will. It cannot hurt. They're only clothes.